In the metric [decimal] system, milli- denotes 1/1 000 of a unit, thousandth [U.S.] and thousandth part [U.K.]; 10-3 [0.001] The metric symbol for milli- is m.
A time period of one thousand (1,000) years: The archaeologists found remains that span a millennia and are a fantastic discovery. © ALL rights are reserved. When used in reference to Scripture, and eschatology specifically, it is the future time in which many believe Christ rules on earth for 1,000 years (New Testament, Revelation 20:1-4). 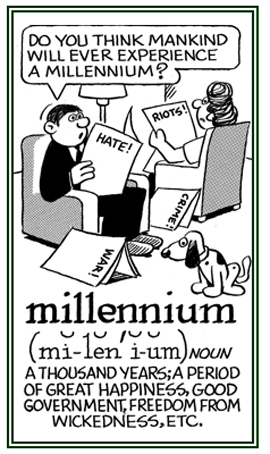 When studying the millennium, one encounters three differing views: "premillennialism", "postmillennialism", and "amillennialism". Then I saw an angel coming down from heaven, having the key to the bottomless pit and a great chain in his hand. and will go out to deceive the nations which are in the four corners of the earth, Gog and Magog, to gather them together to battle, whose number [is] as the sand of the sea. They went up on the breadth of the earth and surrounded the camp of the saints and the beloved city. And fire came down from God out of heaven and devoured them. The devil, who deceived them, was cast into the lake of fire and brimstone where the beast and the false prophet [are]. And they will be tormented day and night forever and ever. "New King James Version"; 1996-2008; Blue Letter Bible. Related "metric" families: yotta; zetta; exa; peta; tera; giga; mega; kilo; hecto; deka; deci; centi; micro; nano; pico; femto; atto; zepto; yocto.